Two convenient detectors for the presence of Formaldehyde in any Solid or Liquid, including foods. ChemSee’s Formaldehyde Detectors utilize well-known chemistry packaged in an easy-to-use dipstick or swab detector to test a suspect sample. A purple color will form on the detector if Formaldehyde is present. 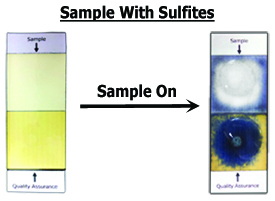 We are proud to present a new and redesigned SulfiteCheck™ detector. This new detector comes equipped with a built in Quality Assurance test that lets the user know if the detector is working properly. Testing can be done in three easy steps. 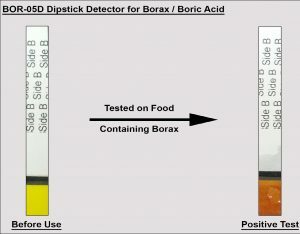 The BOR-05D Detector for Borax is a simple and quick method to check for the presence of Borax in a food or liquid sample. Borax ends up in foods or drinks by intentional or accidental addition. Borax, when consumed can cause ill health-effects and can lead to death. Hydrogen Peroxide is used in food production to sterilize equipment used to process foods. ChemSee-Foods now offers simple, disposable, strips for detecting if there is Hydrogen Peroxide in Milk or other foods. Nitrates and Nitrites are used in food production to reduce spoilage. These chemicals can be harmful to children and the elderly. ChemSee-Foods now offers simple, disposable, strips for detecting Nitrates and Nitrites in Drinks and Foods.